This is a wonderful tour package giving very good experiences. Major Difference of this package as compared with other regular tour packages is about your accommodation. Yeah! 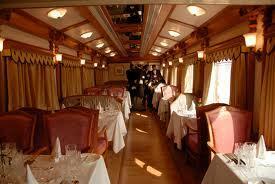 It is not in luxurious static hotels, but with in the moving luxury train with all modern amenities. This will give you very rare experiences. Duration of the Package is 7 night and 8 Days. Travel Detinations includes are Bangalore, Chennai, Mamallapuram , Pondicherry, Tiruchirapalli, Thanjavur, Madurai, Kanyakumari, Thiruvananthapuram , Backwaters at Allepey and Kochi. Meeting point will be at the Leela Palace in Bangalore at 12.00 hrs. After having a good lunch it may be time start your tour. You can enjoy sightseeing of the metropolitan city, Bangalore. Later in the evening check In at the Bangalore Railway Station on your hotel train "The Golden Chariot – Splendor of The South". This will act as a comfortable home for the next one week time. 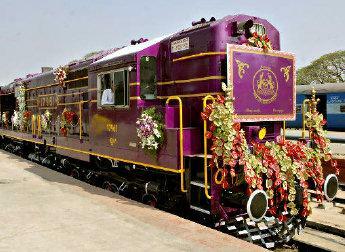 Train stars its journey at 22.00 hrs. It may be arrived in Chennai at 06.00 hrs. Places to visit includes Mamallapuram, an ancient coastal port, south of Chennai, world famous for its shore temple,Kings of Kanchipuram, the first Tamil dynasty after the fall of the Gupta Empire. After having a good lunch at Mamallapuram, you can proceed to visit the Chennai city. Later you can start your journey to Pondicherry only after the dinner. Arrival at Pondicherry at 08:00 hrs. Pondicherry is located in the Northern Tamil Nadu region. Formerly a French colony settled early in the 18th century, Pondicherry became part of the Indian Union in the early 50's when the French voluntarily relinquished control. French is still widely spoken language there. Places to visit includes Auroville. Conceived as a tribute to Sri Aurobindo, Auroville is an entirely new concept in education and urban living. The Aurobindo Ashram is known to the world over as the "Centre of Integral Yoga". In the night, after the diner the train continuous its journey to Tiruchirapalli at 22:00 hrs. Train arrival in Tiruchirapalli may be early in the morning. visit the most famous landmark is 'The Rock Fort Temple and Ucchi Pillayar Koil – A Lord Ganesh Temple. After that proceed for a sightseeing tour of Tanjavoor where you will visit temples built during the 10th and 14th centuries. Also visit Brihadeshwara temple. Then departure to Madurai. Train arrival at Madurai on 08:00 hrs. You can proceed for a sightseeing tour of Madurai. Places to visit includes the famous Meenakshi Temple, Thirumalai Nayak Palace and Thiruparangundram temple. You can enjoy morning with Sunrise at Kanyakumari. Kanyakumari is southern most district of Tamilnadu state. Kanyakumari is the meeting point of three seas such as Bay of Bangal, Indian Ocean and Arebian Sea. Breakfast and Lunch will be served on board and in the afternoon depart to Thiruvananthapuram. Palace to visit at Thiruvananthpuram is h Kovalam Beach. In the evening there will be a Gala Dinner and Cultural Show at The Leela Kovalam.Overnight in train continue its journey to Alleppey. Arrival in Allepey on 09:00 hrs. visit to Vembanad lake, the largest backwater stretch in Kerala and enjoy cruising along in a traditional boat. Then to Kumarakom, one of the best tourist attractions in Kerala. Have your Lunch at kumarakom and afterwards drive to Kochi. Places to visit at kochi includes Dutch Palace (Mattancherry Palace), St. Francis Church (closed on Sundays), traditional fishing hamlets and the fisher folk in their colorful costumes. In the evening you can enjoy Kathakali dance and dinner. After Dinner departs to Bangalore on 22.00 hrs. Arrival at Bangalore in the Morning. After breakfast it is time for departure to your next destination. Here ends your South India Tour. Alcoholic beverages,Personal expenditures like tips, Spa Wagon, Business - centre, etc, Visa for India , Flights etc.